Building Castles in Air is the fourth release from heavy progressive rockers Lucid Fly since 2005, but it’s the band’s first full-length release. Nikki Layne (vocals), Doug Mecca (guitarist), and Aaron Ficca (drums) combine their talents to create a powerful, weighty, brooding tour de force. The album moves along at a slow tempo, as if weighed down by its heavy guitars and drums, carrying its power slowly and deliberately. Yet even with all of its weight, Lucid Fly finds the ability to soar, lifted at least in part by Nikki Layne’s rising, falling, soaring vocals, but also by the progressive nature of its instrumentation, able to reach exceptional heights without losing any strength and power. Vocally, Nikki reminds me a lot of Rescue Aurora‘s Brittany Flynn. 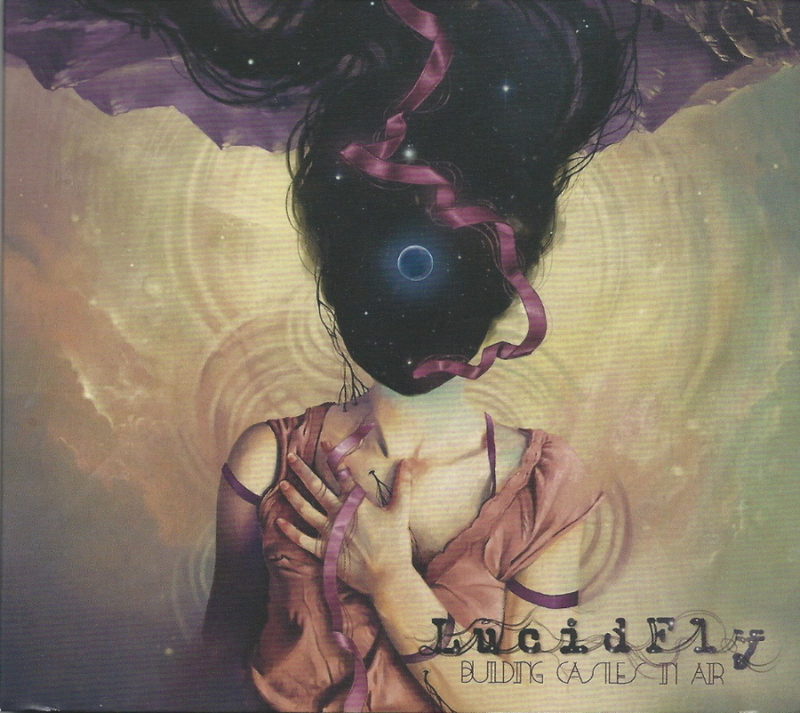 Though Lucid Fly is progressive heavy metal while now-defunct (and much less widely-known) Rescue Aurora was heavy alt-rock, the two bands’ penchant for powerfully deliberate tempos further amplifies their vocalists’ similarities. Lucid Fly opens Building Castles in Air with “Billowy and Broken,” easing the listener into the band’s power with bits and pieces of unleashed fury displayed periodically, offset by an erstwhile mellowly soaring music bed and strong vocals, mixing softness with strength and power. By the end of the song, the shift has been made to power; a perfect entrée into the heavy progressive rock world that is Building Castles in Air. Stylistically, this could easily be listened to as a mood-setting album, a work that creates a feeling, with individual songs being less important than the complete collection. It suggests the sort of band whose concert would be amazing simply because of an overriding sound, one that draws listeners in for that reason alone. Then, of course, after multiple listens, the songs begin to separate themselves, carve their individual identities, and favorites begin to emerge. “Billowy and Broken” is one standout, and it’s followed by another, “Circles Into Squares,” with edgy vocals punctuating the powerfully atmospheric guitar line. “No I in Voice” shares its power in a seemingly asymmetrical manner, as if the whole song is off-balance and about to topple over, atmospheric in parts, yielding to driving power via forceful drumming and a whirling, heavy guitar line. I never really quite groove along with the song, as it always seems a bit askew – very creatively interestingly so. “Ribbons” would stand out by itself, but it serves the purpose of steadying the ship, as well, by immediately following “No I in Voice.” “Ribbons” hints at the same whirling guitar in spots, but it’s more of a straight-ahead, steadily-balanced, centered mid-tempo rock tune. One with pleasingly powerful vocals, occasionally soaring with the music, building in power and releasing during softer musical bridges. Finally, the last song I’ll mention individually is “Next to Strange.” It has an incessantly driving rhythm with interestingly tempo-overriding vocals seeming to soar but actually just punctuating the song’s gentle intensity. This is, at least to me, quintessential progressive hard rock at its finest. As a whole, Lucid Fly’s Building Castles in Air is an all-encompassing listen. It envelopes the listener with a slow but heavier-than-a-brick-wall progressive sound, as powerfully weighty as it is musically meanderingly progressive. Again, it almost seems odd to review the individual songs as the entire album is an entity, a terrific beginning-to-end listen. It also captures such power that I’m guessing Lucid Fly must most certainly deliver a blow-your-face-off live performance worth seeing… and feeling. This entry was posted in Album Reviews and tagged Album Review, Geoff Wilbur, Lucid Fly. Bookmark the permalink.